I’m now getting in excess of 15,000 hits per month on the above chart link. This link is my personal chart list and has become my only chart reference. I draw the trend lines and wave counts on a daily basis (sometimes more often). When a market move has been going in one direction for a lengthy period of time, you will only find the trend lines and wave counts on charts with longer time frames. This gives perspective to the lines and counts. Perspective was a favorite of Edson Gould. I restrict my trend lines and wave counts to only a few charts, TSX, DJI, SOX and COMPQ. The other charts on the page are usually for confirmation of the trend and wave structure. Pages 10 through 13 are indicators. The indicators are used to simply look for some type of leading action before a turn or confirming action of the wave count. Page 10 is a look everyday page. The other indicator pages are less frequently visited. Page 14 through 26 are sector ETFs. They represent most of the active sector ETFs and are always a good bet when looking for something that is breaking in a new direction. Page 27 through 39 are growth stocks. These are stocks that have risen in price since 1990. One qualification is that they must not be severely damaged in a bear market so they can’t rise to significant new highs in the following bull market. The growth stocks show daily market action for the last 3 years and weekly prices since 1990. This gives a good perspective of how they have behaved in the immediate past (daily charts) and how they behaved during good and bad times (weekly charts). When the market breaks a channel (regardless of the perceived wave count), the current step has been terminated. (Make sure your channel was correct before calling a termination). The correction following the second step is larger than the correction that followed the first step. Obviously the correction following the third step will be larger than the preceding two corrections. Reading the glossary helps in the understanding of this blog. As I have said before, follow my trend lines and wave counts on my chart link (above) to keep up to date on my current thinking. There are no explanations on the charts other than lines and numbers, but if you follow my wave count strategy (above), you’ll understand my viewpoint. Jeff Saut and I seldom disagree and the following quote from his weekly comments finds us in total agreement. “Webster’s defines the word “crescendo” as, “The peak of a gradual increase; or a climax.” And, that’s the climatic feeling I got last Thursday when the D-J Industrials (INDU/12231.11) sprinted some 340 points on the European euphoria to close above 12000 for the first time since August 2, 2011. Such action caused one old Wall Street wag to exclaim, “Buy on the cannons and sell on the trumpets!” Clearly we bought on the “cannons” back on October 4th when the indexes broke below their respective August 8th and 9th selling-climax lows. That “call” was driven by the belief the October 1978/1979 analogues would continue to play. Recall those late 1970s patterns saw the averages slightly undercut their “selling climax” lows before the bottoming process was complete. Accordingly, we termed this year’s October peek-a-boo “look” below the early August lows as an undercut low and advised participants to buy the index of their choice. Gotcha’ Nouriel Roubini … Gotcha’ Harry Dent … Gotcha’ Robert Prechter, for while such pundits were contemplating the end of financial life as we know it, the S&P 500 (SPX/1285.09) looks to have posted its biggest monthly gain since October 1974 (~16%); and likely the tenth best month since 1928. Verily, from the October 4th intraday low (1074.77) into last Thursday’s intraday high (1292.66) the SPX has gained ~20.3% with many investment vehicles doing much better than that. The culprits for the massive move have been better than estimated economic reports (which have taken recession fears off of the table), a kiss and makeup from Merkel and Sarkozy, and great 3Q11 earnings reports. In fact, as of this morning, the 323 companies in the S&P 500 that have reported thus far have showed year-over-year earnings up 24.3% with revenues better by 12.8%. That’s a company earnings “beat rate” of 64.7% combined with a revenue “beat rate” of 63%. The result has left the SPX’s consensus 2012 earnings estimate nestled around $109, implying a forward P/E ratio of 11.7x. Given such metrics I’ll say it again, “To an underinvested portfolio manager (PM) the current news environment is a nightmare.” Yet surprisingly, the world remains profoundly underinvested in U.S. stocks. That said, the upside skein has left the markets overbought in the short-term with 93.6% of the SPX’s stocks above their 50-day moving averages (DMAs). Back at the market lows that figure was only 4%. 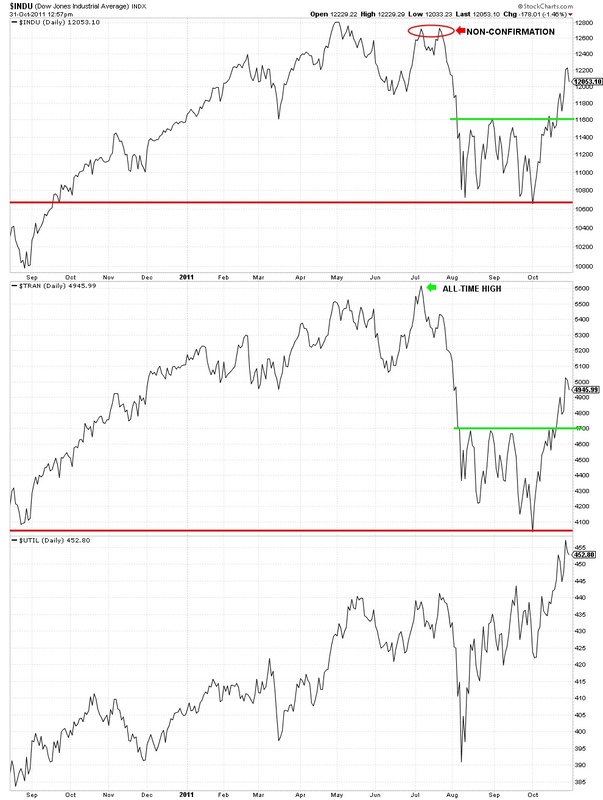 Additionally, the McClellan Oscillator remains about as overbought as it ever gets. Moreover, the “buying stampede” now stands at session 19. Readers of these missives know such stampedes tend to run 17 – 25 sessions, with only one- to three-session pauses and/or pullbacks, before they exhaust themselves on the upside. Therefore, with the major averages up against overhead resistance levels, as well as trading around their 200-DMAs, it would not be surprising to see a longer pause (or pullback) than the one- to three-session pattern we have been experiencing since the 10/4/11 lows. To us, the real question is – will the SPX get a pullback to the often mentioned pivot point of 1217, or will any pullback be short and shallow? Well, by our work the equity markets still have a lot of internal energy to power their way higher, so our sense is the SPX will keep pushing higher in the months ahead with only shallow pullbacks and sideways pauses along the way. Edson Gould, Premier Stock Market Strategist – Edson Gould had a profound influence on the development of my techniques and proprietary indicators. Prior to my subscribing to his advisory service, I was just one of the crowd. After 40 years I still have many of the publications from his advisory service, “Findings & Forecasts”. Fearing the loss of these hard copy reports I have recently created pdf files of these reports. Now I have hard copies and computerized versions of the reports. I have used a technique of his that I found in an obscure reference in one of his reports. It was only mentioned once and never again. I believe that he used this tool and never told the world it’s importance. Prior to my finding this Edson Gould tool, I had been trying unsuccessfully to find a different way to chart the market. When I read about his technique I knew instantly that this was exactly what I had been seeking. I have charted this method back to 1939 and found it to be very useful. On occasion I may post one these charts. This man was truly a legend in his own time. It’s too bad that today most people have forgotten or never heard of his discoveries. Because of this I have posted some of his advice from the 1970s. It’s my small contribution to memorializing a giant of technical analysis. ALL ACTIONABLE SIGNALS (buy or sell) ARE ONLY FOR SHORT TERM TIME FRAMES. These signals are not designed for intermediate or long term time frames BUT . . . . .